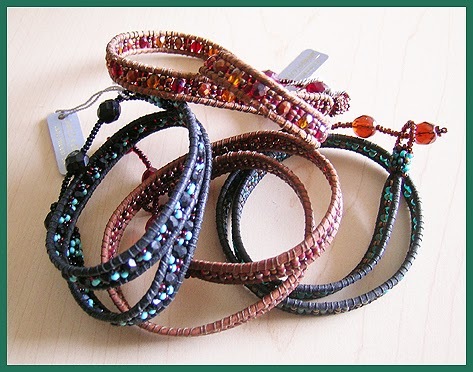 I scrounged around the office to find some old leather & beaded bracelets from the early days of Dunitz this morning. I discovered a few leather chokers (SKU: LCH1 or leather choker 1) shown here to the right. 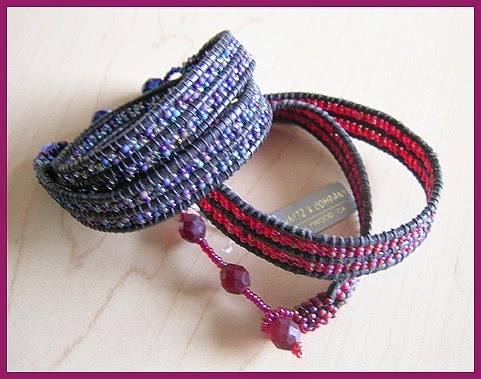 They adjust AND they can be wrapped as a bracelet. The next season we introduced skinnier ones and wider ones. We added crystals to the mix. Every season we've added new styles which changed up the sizes, shapes, components - you name it. These designs started around 1993. And, we've been selling these bread & butter bracelets ever since. The bracelets shown in the bottom photo here (SKU: LP12) have been in the line FOREVER. Each season we change the colors. Not only are they fun and well made, they are very affordable. 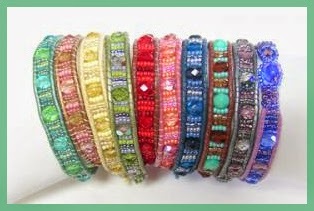 Most stores retail this bracelet (SKU: LP12) for anywhere from $14-18.00/each. We've made oodles of them for our 'private label' customers including the likes of J.Jill and Peruvian Connection. Did I mention in my last post that emulation is the sincerest form of flattery? Yes I did. I remember around this time, one now well known designer came into my trade show booth at the Los Angeles Gift Show. She studied the line and then wrote an order for her shop to be shipped COD. (Cash on Delivery.) We had no idea who she was. We were excited to be writing an order for a new client. Guess what? She refused the COD shipment when it arrived to her shop. Of course, we produced the order. And she had plenty of time in our booth to study the line. To this day, I can't tell you how many people walk into my trade show booth and tell me my line reminds them of the work offered by this designer. My response is usually, "Oh. nice. 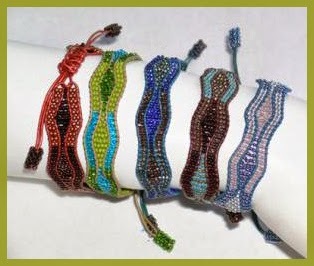 Yes, we've been showing beadwork since 1990 and also creating our leather & beaded bracelets forever. I think you'll find them very very affordable." a word less is usually the best policy :). We definitely did not copy this designer. BTW, if you're on a tight budget for your store - write me privately. We do have stock of our originals that are not on our wholesale website. Let's talk. We may have some bracelets and chokers perfect for you and your bargain hunting customers.